Fertilizer Pollution of Water Tests fertilizer pollution runoff from irrigation water and storm water. Fertilizer Pollution of Water Tests fertilizer pollution runoff from irrigation water and storm water. Experiment for a first time science fair project. Testing only takes a few minutes per sample. Each water sample is tested for this Set of parameters: Nitrate, Nitrite, Phosphate, Alkalinity and pH (5 Tests per set). Nitrate / Nitrite test strips are for testing water in many applications from drinking water to water used to wash produce. Nitrates and nitrites occur normally in nature from the breakdown of ammonia in the nitrogen life cycle. Nitrates in nature cause plant and algae growth that may affect the balance of water-based ecosystems. 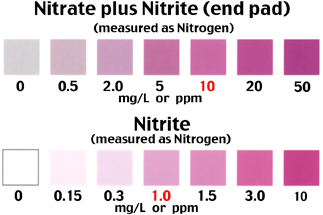 The Color Comparator Chart for this test reports concentrations compatible with EPA limits of total nitrogen and nitrite nitrogen in water. NO2 (as N): 0.15, 0.3, 1, 1.5, 3, 10 mg/L or ppm. concentrations, phosphate is involved with regulating bilogical growth and productivity in natural waters. Phosphate in micrograms/L or ppb. ~0, 200, 400, 600, 1000, 2500 microgms/L or ppb. (Note: concentration units are micrograms per Liter or parts per billion). Results are obtained from this test in about 1 minute. pH and Total Alkalinity are two of the most fundamental parameters in drinking water testing as well as a great variety of other applications of water usage. Alkalinity indicates the buffering capacity of natural waters. A water is buffered if the pH does not change greatly by addition of acids or bases. The most effective buffering action is within the pH range of water from 6.0 to about 8.5. 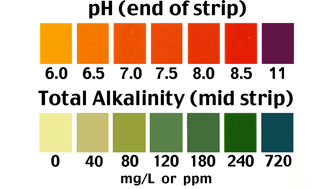 The productivities of water can be correlated with ph, alkalinity and the buffering system. The color charts for these tests read pH levels and Total Alkalinity in mg/L or ppm. Total Alkalinity 0, 40, 80, 120, 180, 240, 720 mg/L or ppm. Both tests are on the same test strip. Results are obtained from this test in 25 seconds. 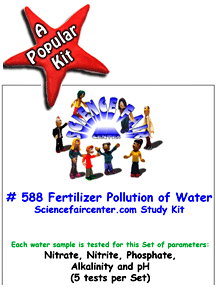 Fertilizer pollution runoff from irrigation water and storm water. Experiment for a first time science fair project. Testing only takes a few minutes per sample.